Fewer steps for social media sharing: you can now upload your primary picture together with the brief listing info, which cuts down the time significantly. Create a basic listing site in less than a minute and share it to social media easily using the new confirmation page. Since you already have the first picture published, you are ready for social media sharing. You can then go on with adding unlimited, additional photos and more detailed content to your site. Sold listing marketing improvements: many of the RealBird power-users have been using the sold listing marketing feature to win more listings and there are now even more ways to promote your past sales. Using the new Sold RSS feed (under Listing Widgets > RSS in the member area) you can now autopost solds to social media and create new type of sold widgets for your sites, blogs and Facebook pages. We are also auto-sharing your sold listings through our Twitter feed, providing you with additional exposure. Large images are now stored with your listings: For the last half year, we have been testing even larger versions of your unlimited listing photos stored for your RealBird listings sites. 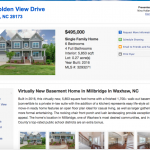 We settled with 2000 X 1500 size as an optimum for performance and quality and you’ll see many new listing presentations and listing marketing tools (postcards, sign riders) being launched soon, utilizing the larger images. Make sure you upload your best quality photos. Homes By SMS: our new flagship SMS real estate marketing service is gaining traction: As a reminder, Homes By SMS is an all-inclusive buyer prospecting (SMS home search), seller prospecting (SMS postcards, sign riders) and listing marketing tool for your current homes for sale that can be integrated with one of our own property search tools or with your existing IDX website. It’s an all-inclusive service, we setup and provide you with all the tools including a free sign rider, postcards etc. for one low monthly fee. If you considered dominating your market with SMS text code marketing, Homes By SMS is the tool for you. We hope you enjoy these new features and stay tuned for some major announcements soon! As always, thanks for using RealBird and let us know if you have any questions, just call or email.